When most of us think of housing shortages, we think of the micro-apartments of Hong Kong or New York. But Stockholm is in the midst of its own shortage, and with it, incredibly resourceful solutions. Take, for example, this 387-square-foot apartment in an old storage unit. 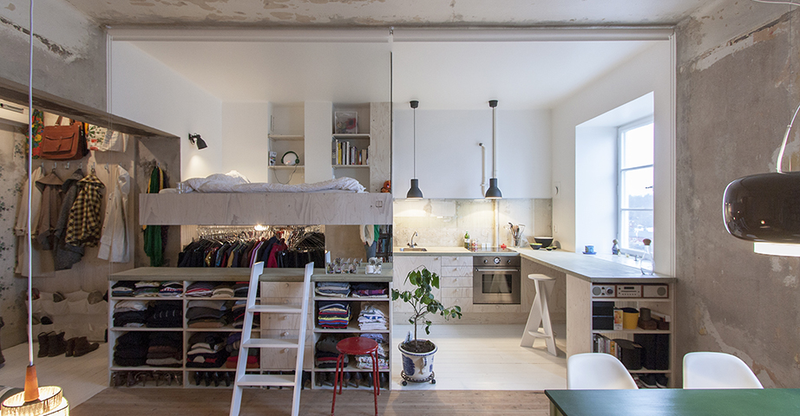 According to Karin Matz, a young architect based in Stockholm, this tiny space had been used as a storage space for furniture for 30 years before she happened upon an ad for the unit. "The previous owner had begun a renovation in the 1980s but fell ill and the apartment was left untouched until his death," she writes on her website. "Time had been frozen; wallpaper was half removed, only a few tiles and a kitchen faucet were sticking out of a wall, there was no electricity and a bathroom only with signs of rats as inhabitants." But the space, and the view, had potential—it was "impossible to understand and resist," she says. So Matz got to work turning the unit into something liveable. Rather than gut reno the entire space, she chose one area to overhaul completely, adding electricity, stacks of IKEA kitchen fittings, and new white paint. This is the structural core of the home, where an incredible number of functions are stacked like a double decker. But the rest of the space Matz left relatively untouched, for contrast. Though she peeled away rotting wallpaper and shored up leaks, much of the rest of the apartment is as she found it. One exception: The green-tiled bathroom, which you step up into to access.